Boost your energy levels with NeuroGum Nootropic Energy Gum that offers all the brain-boosting elements in a single element – chewing gum. Enriched with a patented blend of caffeine, L-Theanine, and B vitamins, NeuroGum is a breakthrough in nootropic market. NeuroGum boost brain function without triggering any side effects such as jitteriness or crash. What is NeuroGum Nootropic Energy Gum & how does it work? Instead of taking pills, capsules, or powders, simply chew this NeuroGum Nootropic Energy Gum. It comes with a mint-flavor that comes with a patented combination of ingredients. These ingredients include caffeine, L-theanine, and B vitamins. It does not contain any aspartame (an artificial sweetener). As per manufacturer’s claim, NeuroGum is scientifically proven to boost your energy, focus and concentration levels. It also reduces stress, improves cognitive function, alertness, ability to recall better and overall memory. NeuroGum’s patented cold compressed feature maximizes the absorption rate and retains the potency of the ingredients to give you better energy levels. Improving memory and energy by simply chewing gum? Let’s delve into the matter further. NeuroGum Nootropic Energy Gum is filled with nootropic ingredients that are absorbed by the mouth directly unlike a pill or drink that predominantly works from the stomach. This benefits the body by delivering results 5x faster than drinks or supplements. Vitamin B6 (30% DV) – boosts psychological function, increases metabolic rate, and raises the level of energy. We are happy that NeuroGum mentions the daily allowances since many supplements leave it out. Recommended Daily Allowances (RDA) vary greatly between people. For instance, RDA of Vitamin B12 comes with a range of 2.4mcg and 100mcg based on your age, gender, and whether you are pregnant or not. Use NeuroGum whenever you feel tired, have an unwanted craving, or feeling out of focus to achieve immediate results. Overall, NeuroGum review has been good so far. People report that the texture of the gum was awesome and it stayed soft for a long time. Unlike other gums, it doesn’t become hard and stays soft. The flavor is good and users could see results at lower dosages without feeling crash or any jittery feeling. Few people use it before jogging, running as it keeps them energetic w/o any triggering any fatigue. On the other hand, few users feel that the ingredient sorbitol is not really a motivating factor. Few say that it sticks to the teeth while others say that the bitter taste of caffeine is just awful. A couple of users reported headaches after using this gum. But then there are no serious reports or any other side effects noted by users. The manufacturer offers a 30-day return policy on NeuroGum. If you are not happy, simply return it within 30 days from the date of purchase and you will be refunded accordingly. Where to buy NeuroGum Nootropic Energy Gum online? 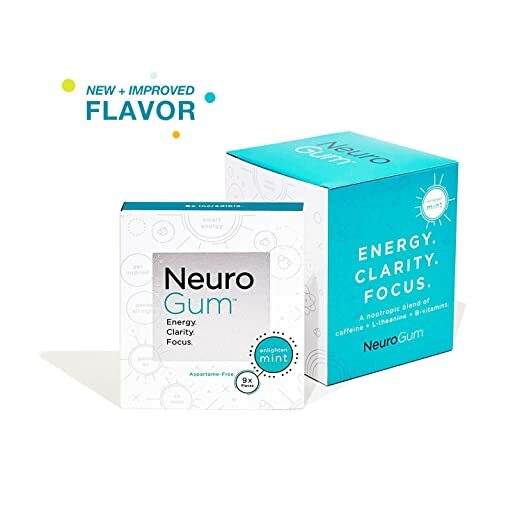 NeuroGum Nootropic Energy gum is available on Amazon, eBay, and at Walmart at best price. Are there any NeuroGum discount coupon codes available? The price of NeuroGum is really affordable which negates the use of promo deals or discount codes. However, if you need NeuroGum at bulk quantity, you can purchase it for the wholesale price using discount codes available at various sites such as Groupon. Is NeuroGum available in Australia retail stores? Yes, you can order NeuroGum online anywhere worldwide including Australia, UK, Canada, with eBay or Amazon websites of respective countries. The simplicity of the nootropic gum, its reviews, features, and benefits are quite impressive. But the stand out feature is its delivery rate (or absorption rate in the body). This is what makes us highly recommend NeuroGum Nootropic Energy Gum. A simple alternative to coffee or carbonated drinks, NeuroGum is worth a try.